On the face of it, the Lenovo IdeaPad S405 is a minor revelation - the Chinese PC powerhouse has somehow managed to cook up an Ultrabook for a full price of £449.99 (around US$688 / AU$662), with a current online selling price of £399.99 (around US$612 / AU$588). Not hard, you might think, when economies of scale are put into practice, but is it really possible to get premium looks, performance and portability at this price point? The simple answer is a big fat no. But don't forget - this is cheap as chips territory for an Ultrabook. But this is a very different kettle of fish; it's a far cry for those used to the Windows operating system. Recently, some of the other big league manufacturers have attempted to come up with their own rendition of the budget Windows laptop, such as Asus with the S56CA and Acer with the VivoBook S200 and theVivoBook S400C, but all three breach the £400 mark by some way. Otherwise, for this sort of cash you're left with a workman-like laptop such as the MSI CX640MX, which, quite frankly, isn't much to look at. So, if not Ultrabook in performance terms, what does the Lenovo IdeaPad S405 offer? A while back we got our hands on the Lenovo S300, and were pleased with its adequate performance, good build quality and portability, along with an outstanding price tag. The Lenovo S405 is a spin on this budget ultra-portable laptop genre, but this time round what you're getting is a bigger 14-inch screen and a low-voltage quad-core AMD A8 processor. 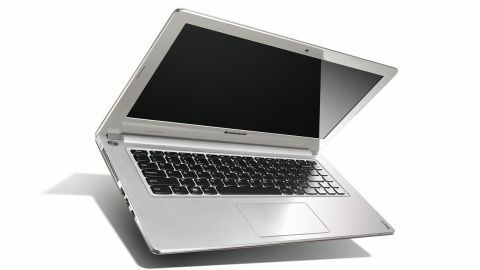 Lenovo also makes a version called the IdeaPad S400 that has a second-generation Intel Core i3 processor installed. Unusually, it costs exactly the same as the Lenovo IdeaPad S405. Naturally, the majority of people will probably go for the more established brand, making the Intel offering an easy choice, so you have to wonder why Lenovo has brought the AMD-powered S405 version to the game. Who exactly is it marketing it to? Technically, we can't call the Lenovo IdeaPad S405 an Ultrabook, because it falls short of the requirements laid out by Intel. For starters, there's no Intel processor and the 500GB hard drive is a lowly mechanical spinning unit. You do get a tantalizing quad-core AMD A8 processor and onboard graphics courtesy of a Radeon HD 7460G, while 4GB of RAM is sufficient to keep Windows 8 ticking along nicely. It's not surprising to see fairly low-end components featured here when the price tag is as low as it is. On the plus side, you do get a decent level of connectivity for your money, including HDMI for connecting up to a screen and outputting Windows 8 without loss of detail, as well as a USB 3.0 port, two USB 2.0 ports, a headphone port and an SD card slot. There's also a handy one-touch recovery button - great for those who want an easy way to restore Windows from a backup without having to delve into the settings, although in our opinion it's not exactly hard to do these days. Due to the size of the Lenovo IdeaPad S405, there's no optical drive built in, so you'll have to make do with internet-based facilities if you need to install software or watch movies. The one-touch recovery facility comes courtesy of Cyberlink, and the company has included some of its other apps too, such as YouCam, which you can combine with the built-in webcam to take pics and record videos. The webcam isn't the best we've ever seen, but it's certainly adequate. Unlike the Lenovo IdeaPad S300, which is a fairly basic laptop to begin with, the Lenovo IdeaPad S405 goes one step further and strips the exterior of any extraneous functionality. It's bereft of features such as a quick boot button, touch scrolling on the trackpad or even a simple volume control. With no dedicated function buttons on the Lenovo IdeaPad S405, conventional duties are relegated to the Function shortcut key on the keyboard. This seems to work fine, though we did find that the volume control - for example - was a little on the unresponsive side, and required a certain type of approach in order to get it working. With Windows 8 onboard, you might expect the Lenovo IdeaPad S405 to have a touchscreen to take advantage of the Modern UI. Well not at this price point, though you do get a trackpad that is capable of multi-touch gestures, such as side-scrolling through apps or bringing up the charms bar. This is pretty neat, but some of the functions worked better than others. While the Lenovo IdeaPad S405's isn't exactly what you would call stunning, at least not in the realm of something like the Acer Aspire S7, it's not at all bad, given the price tag. In the hand you can tell it's basic; the body flexes here and there and the hinge is a little wobbly and creaky, but Lenovo has definitely made the most of things. When open, the bottom half of the laptop is pure, no-frills black plastic and the screen bezel is a slightly classier glossy black. On the underside, you get a sort of aluminium-effect silver paint job, which isn't sublime, but it works, from a distance anyway. Its stand-out feature is portability, being surprisingly thin and light. You could easily stow this 14-inch laptop in a bag, and it's easy to lug around. It also fits in nicely around the home, whether sat on the kitchen counter or resting on your lap for a few hours.